Powerful tools are needed to design scalable, distributed systems that can take advantage of the agility and organizational efficiencies promised by microservices. Tools like Istio, and service mesh in general, solve some difficult problems like observability, security, and resilience, and are highly encouraged for cloud-native application deployments. An overview on the current cloud-native landscape from a technology perspective including technologies like Kubernetes, Istio, Kafka, and Apache Camel. A discussion on how to "glue" your heterogenous environments, tools, and approaches together in a cohesive cloud-ready strategy. Red Hat's approach to agile integration, including some government case studies. Reference architecture for an open hybrid cloud, supporting both current and cloud-native strategies. Detailed viable strategies to minimize costs by commoditizing existing assets. A tried and tested path to building a lean, agile IT model for true innovation. Modernizing apps and infrastructure to take advantage of new technologies at a viable and stable pace. Invest the resulting ROI from modernization to strengthen the value of your business. In this Red Hat® Consulting whiteboarding video, you will learn how Red Hat Ansible® Automation can be used for full end-to-end infrastructure provisioning from bare metal to applications running on Red Hat OpenShift® Container Platform. Potential attack vectors for container deployments and explain how the combination of Red Hat OpenShift and NeuVector can detect and prevent damaging attacks. How to integrate security into the pipeline using Red Hat OpenShift and NeuVector automation and integration points. Does your organization rely on one outstanding developer for everything? Join Kevin Franklin and Colin Lodter from Red Hat® Consulting in this whiteboarding session to learn about a few strategies that can lessen the load on your key developers and build your other developers up to be like them. You can also learn about more practices and tools by going to openpracticelibrary.com. How can Infrastructure-as-Code (IaC) be used to manage your third-party applications with ease? How does Red Hat® Ansible® Automation and inventories source controlled in git repositories pair up with Red Hat OpenShift® Container Platform to simplify these tasks? 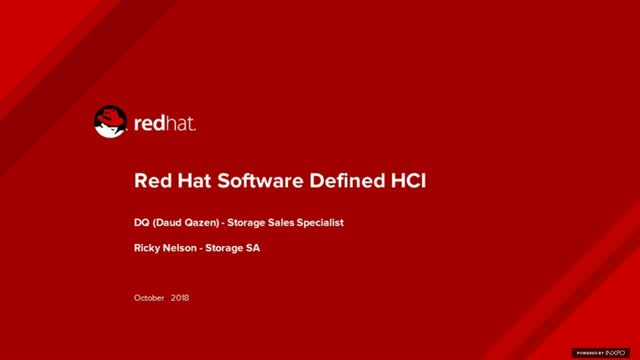 This Red Hat Consulting whiteboarding video provides a brief introduction to IaC, and how it is used to perform the customized deployment of a third-party software solution from a provider such as Dynatrace. It also discusses how IaC can be applied and integrated with existing infrastructure to be managed as a complete solution. In this session, we'll focus on implementation strategy for IT automation and management across hybrid clouds. We'll provide customer success examples, additional market data, and information on how the Red Hat IT automation and management pieces fit together. Learn the market realities and demands that cause IT organizations to look for automation and management solutions–and the challenges they face in trying to implement them. We'll focus on the ways Red Hat can help return control to the organization, and we’ll provide customer examples. Increasingly, enterprise IT organizations are shifting workloads to run in hybrid cloud architectures using a mix of public cloud services and dedicated datacenter resources. New applications are being written and constantly updated using agile methods supported by microservices and containers. Data integration and business process transformation are operational imperatives as enterprises create new information-driven services and customer engagement models. In this hybrid cloud era, the stability and security of core enterprise platforms is critical. Whether deployed on bare metal, a managed cloud service, or on public cloud infrastructure, IT ops teams need to maintain consistent operating system configurations, patches, security policies, and container images. Speed, agility, and security are crucial, as are open source management platforms and programmatic policy-driven approaches. In this keynote, you will learn 5 important ways that your IT operations team must use analytics and automation to ensure future hybrid cloud success. There are many different practices and frameworks to implement agile, and it can be easy to lose sight of why agile integration is needed. This Red Hat® Consulting whiteboarding video introduces a pragmatic take on why business outcomes need to be the focus rather than one right framework. This video covers the Mobius loop and how the addition of the foundation layer can help your organization shift the conversation from how to why. Learn more at openpracticelibrary.com and contribute your ideas at github.com/openpracticelibrary. In this Red Hat® Consulting whiteboard video, Peter Gervase and Andy Myhr discuss the benefits of Red Hat Insights, and how the service integrates with Red Hat Satellite Server 6. Does it take too long for your organization to onboard new developers? Does your organization miss opportunities due to long application delivery cycles? If so, your organization can benefit from adopting a microservices architecture. Join Jeremy Banks and Jim Dillon in this Red Hat® whiteboarding video as they discuss benefits that Red Hat Consulting customers have realized by implementing microservice architectures. If you have a disconnected Red Hat® Satellite server, are considering a disconnected build, or just enjoy everything Satellite, this is the place for you. Critical design decisions to prevent issues later on. Deploying your disconnected setup for the first time and its challenges. A simplified look at operations and maintenance routines. Red Hat® CloudForms® 4.6 provides a new way to migrate virtual machines (VMs) to Kernel-based Virtual Machine (KVM) environments like Red Hat Virtualization and Red Hat OpenStack® Platform in a simple, optimized, and efficient way. Watch this Red Hat Consulting whiteboarding video to see how this powerful tool works. Government agencies demand performance, transparency, and value—exactly what Red Hat and open source offer. Red Hat is the standard choice for Linux in governments worldwide. Our cloud, virtualization, app development, storage, platform and service-oriented solutions bring real freedom and collaboration to federal, state, local, and academic programs. And Red Hat’s worldwide support, training and consulting services bring the power of open source to your agency. We are a part of a larger community working together to drive innovation. Learn more at www.redhat.com/government.